Chiral sulfones are important functionalities of various interesting organic compounds. 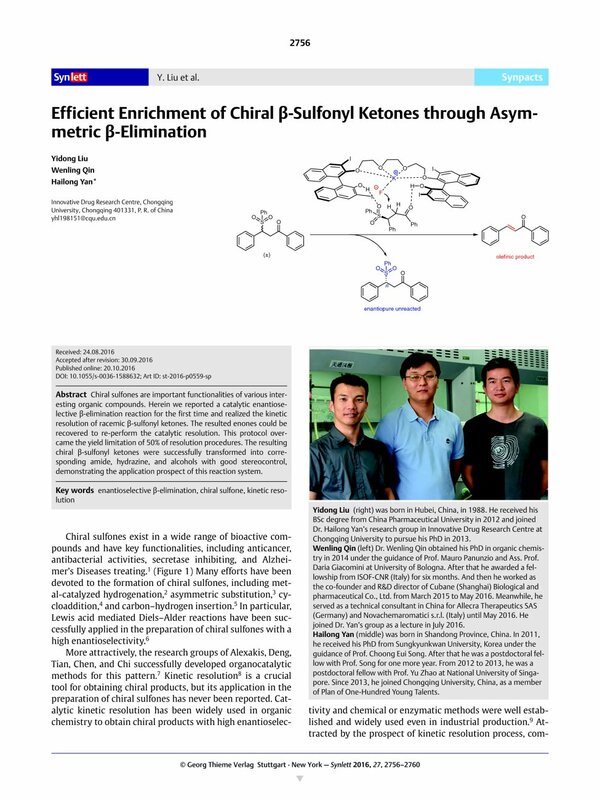 Herein we reported a catalytic enantioselective β-elimination reaction for the first time and realized the kinetic resolution of racemic β-sulfonyl ketones. The resulted enones could be recovered to re-perform the catalytic resolution. This protocol overcame the yield limitation of 50% of resolution procedures. The resulting chiral β-sulfonyl ketones were successfully transformed into corresponding amide, hydrazine, and alcohols with good stereocontrol, demonstrating the application prospect of this reaction system.